Aluminium 6061, very resistant, good handling thanks to a very high quality grip, bat for match and practice Please not that the grip can be either black or white. They are being dispatched in both colors. 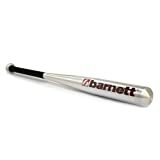 This entry was posted in Baseball and tagged Aluminium, barnett, Baseball by FPSports. Bookmark the permalink.